Prague’s Old Town Hall was built in 1338, under King John of Luxembourg, to house Prague’s first city council. Later in the 14th century the 69.5 metre tower, with its extraordinary astronomical clock, were added. Along with the rest of Prague, the Old Town Hall was renovated in the Neo-Gothic Style when King Vladimir Jagellon took the throne in the 15th century. The building was partially destroyed by the bombings in the last days of World War II. Curiously, the reconstructed section looks older than the original. The Old Town Hall is now open to tourists and visitors can make their own souvenir coins in the tower chamber or climb to the top to enjoy some of the best Prague vistas. Down on the street below Prague’s Old Town Hall, day and night, crowds gather to watch the amazing spectacle as the astronomical clock strikes the hour. 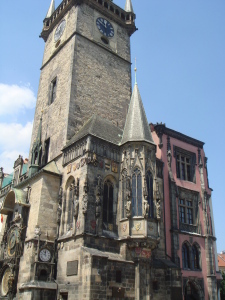 Prague’s first New Town Hall, in Charles Square, was built in 1377. However, little remains of the original building. At the beginning of the 15th century the high tower was added to house the bell and a chapel. In the 16th century, under the Hapsburgh Kings Ferdinand and Rudolph, the south wing was re-built in the Renaissance style. In the 15th century the New Town Hall was witness to a pivotal scene in the history of Prague. On 30th July 1419, Jan Zelivsky led a demonstration at the New Town Hall to demand the release of followers of the protestant dissident Jan Hus who were imprisoned there. When the City Councillors refused their demands were refused the outraged demonstrators stormed the building and threw them from of the windows. This action went down in history as The First Prague Defenestration. It was also the catalyst for the formation of the Hussite movement, a campaign for reform in the Catholic Church, which led eventually to the Hussite Wars. The practice of defenestration became Prague’s method of dealing with uncooperative administrators. The New Town Hall served as the seat of the municipal administration until 1784 when the Emperor Josef II amalgamated the four Prague towns – Old Town, the Lesser Town, Hradcany and the New Town – under one town council. Thereafter it became a criminal courthouse, a torture chamber and a prison where many political prisoners and revolutionaries were incarcerated. Now a national heritage centre, Prague’s New Town Hall is used for many cultural and social events.